Green Aventurine is one of the stones EVERYONE needs to have. Seriously, no gem collection is complete without this workhorse stone that brings abundance, growth, fertility and prosperity of all kinds. Want to grow a plant? Put aventurine in the pot. Want to grow your finances? 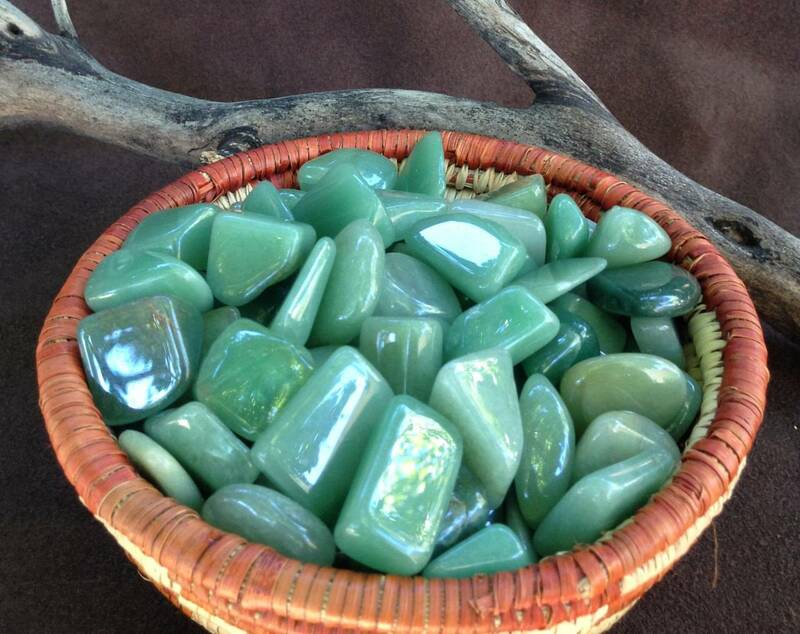 Put aventurine in your purse or wallet, or your cash drawer at work. Want to grow your business? Keep a piece of aventurine at your desk or near your computer. Whatever touches this stone grows. It also attracts new people, experiences, ideas, and relationships. It’s SO important that this listing is for 2 pieces. I’d love to see you keep one and gift one. Sharing gems is one of the pleasures in life. Offer a piece to someone you love and keep yours with you. Spread the gem wealth. This listing is for (2) medium pieces of tumbled aventurine, which will come gift-bagged together in organza with a white sage leaf that you can use to clear energies before using. You also receive a card describing the properties and recommended use of each stone in case you are offering it to another who has not worked with this stone before. I love my green aventurine! Sage goddess provides the best quality.